My favorite place in Ireland is the Giant’s Causeway on the coast of Antrim in Northern Ireland. I love the mystery of it, i.e. the fact that even geologists are not quite sure what created this natural phenomenon. And of course I love the rugged landscape, the stunning coastline, the sheer incredibility of this giant heap of chiseled columns. 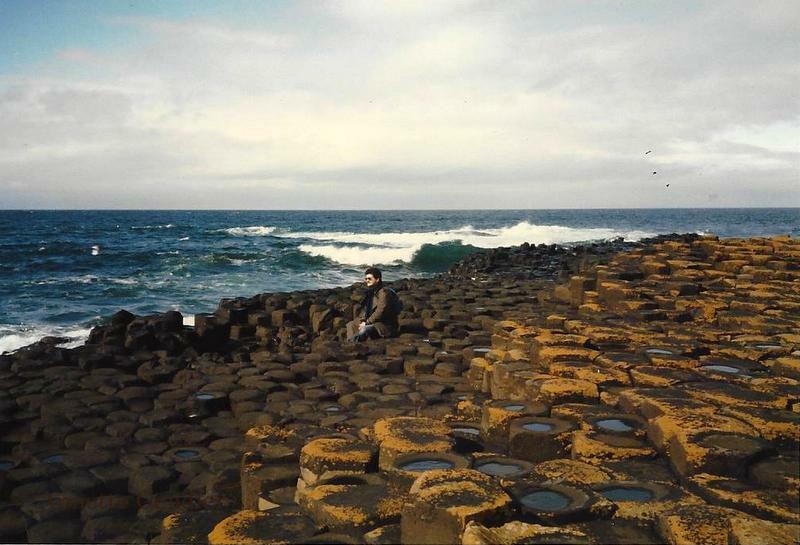 The reigning theory is that this bumpy pile of often hexagonal basalt columns that begins at this spot close to Bushmills on the coast of Northern Ireland, slips into ocean and reappears on the Scottish island of Staffa, was caused by an ancient volcanic eruption. Ireland, however, is hardly known for its volcanoes. So the Irish, of course, have a legend that explains this pile of pilars in a much more entertaining way, hence the name Giant’s Causeway. For me, the added thrill was to see this place again on our trip this summer as my husband and I had visited it before on our Interrail trip in 1986 (see above picture). Back then the Troubles in Northern Ireland were in full swing and tourism as non-existent. We took a public bus from Belfast to Bushmills. I remember the bus being checked for unaccompanied baggage of any kind as bombings were an almost daily feature then. From there we had to hire a cab to take us out to the causeway where we were virtually by ourselves. These days the Giant’s Causeway is a full blown tourist attraction, replete with visitors center, gift shop and shuttle bus, and consequently it is hard to get a good shot of anything without people in it. So, here I am in a meta photo taken by my son. You gotta watch your feet at all times on the Giant’s Causeway! I’ll report more on my impressions of Northern Ireland then and now in subsequent posts. Stay tuned! A magical place. I have no idea when I first heard about the Causeway, but it sparks the imagination. It does! It has such an at-the-edge-of-the-world feel to it. Hi Annette, Love your blog. Your a rolling stone. Ive done mine and now gathering moss gently and in happy retirement with my dog in Lincolnshire. You have a lovely keen eye for detail and a gentle air about you. Keep safe in your travles.